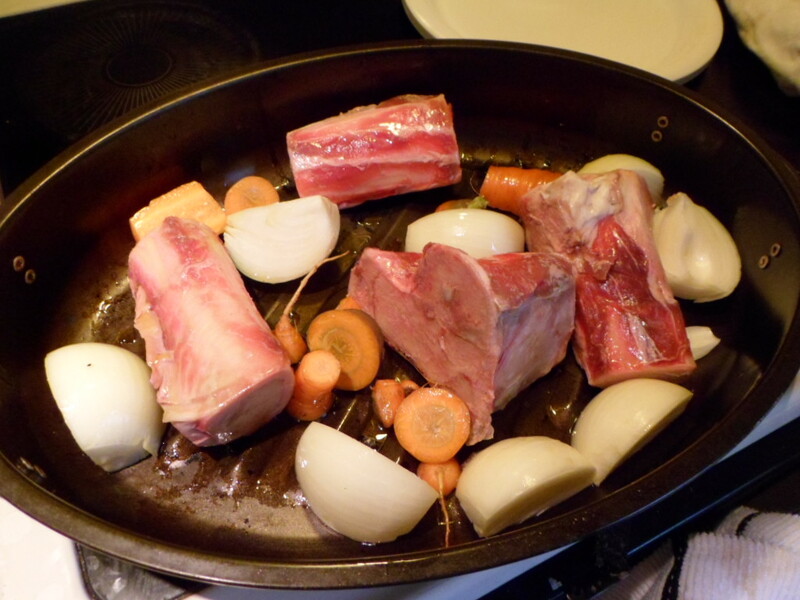 Last month I made some beef stock from bones ordered from Farmers Fresh. It’s been my most successful stock experience to date. I think the secret is putting the cooling stock in the fridge over night so that it’s really easy to skim the fat. I used a beef stock recipe from simplyrecipes.com. 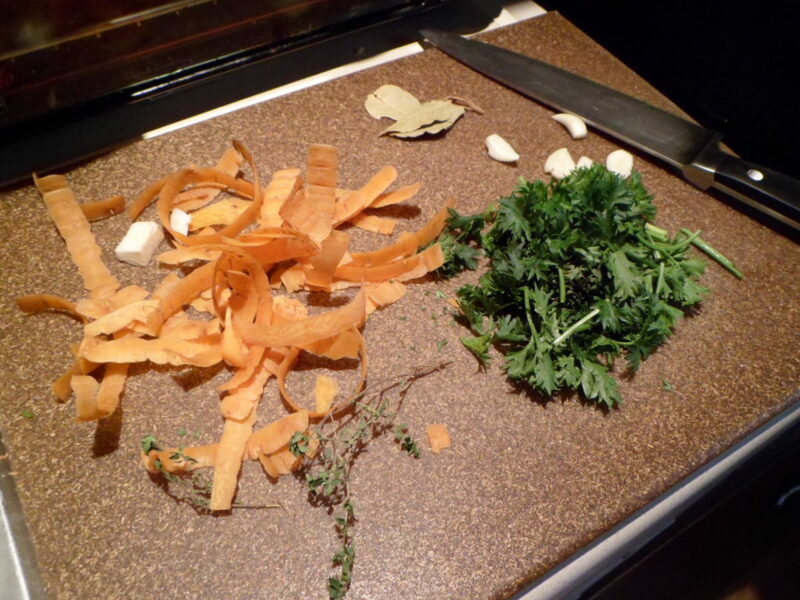 In addition to the bones and some chopped onions and carrot, there were these ingredients . 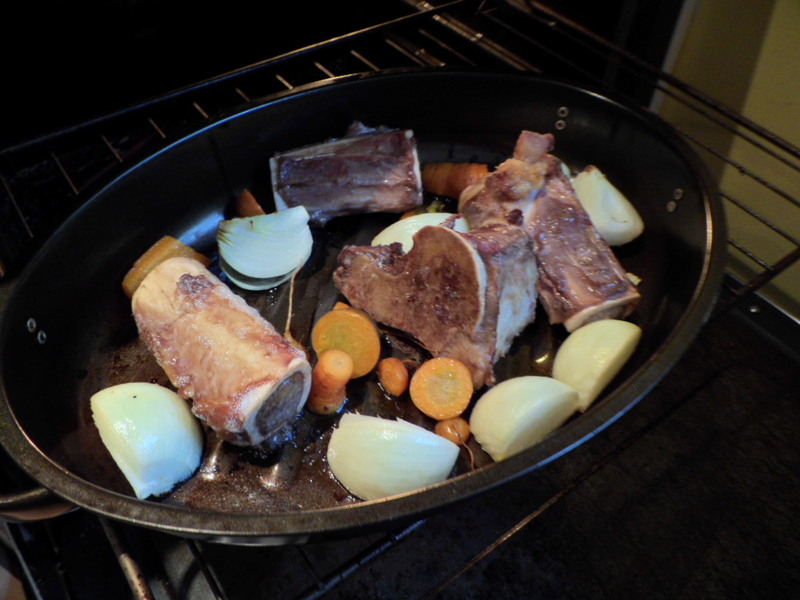 The bones were rubbed with olive oil and put in the over to roast along with the onions and a carrot. Here’s what they looked like after the roasting. 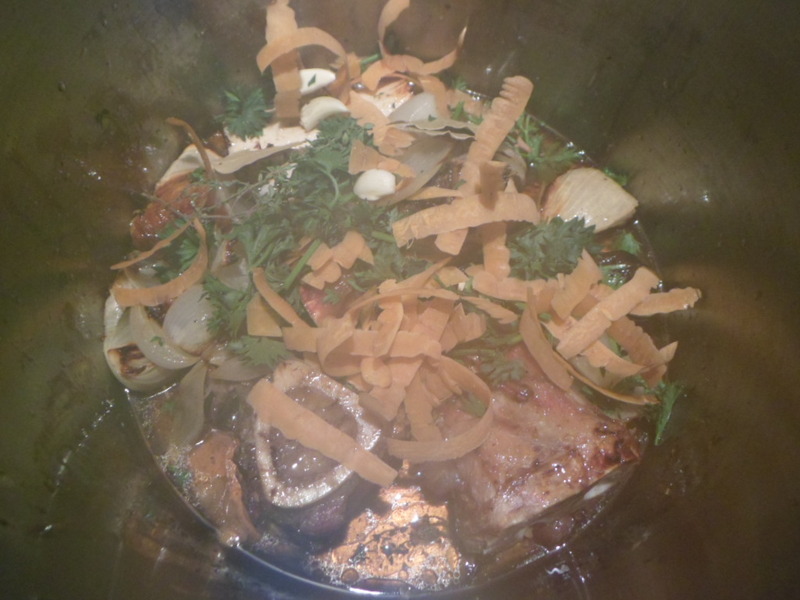 Then the bones, onions, and carrots were dumped in a stock pot and joined by the other ingredients. The roasting pan was deglazed to get some of the last browned bits. 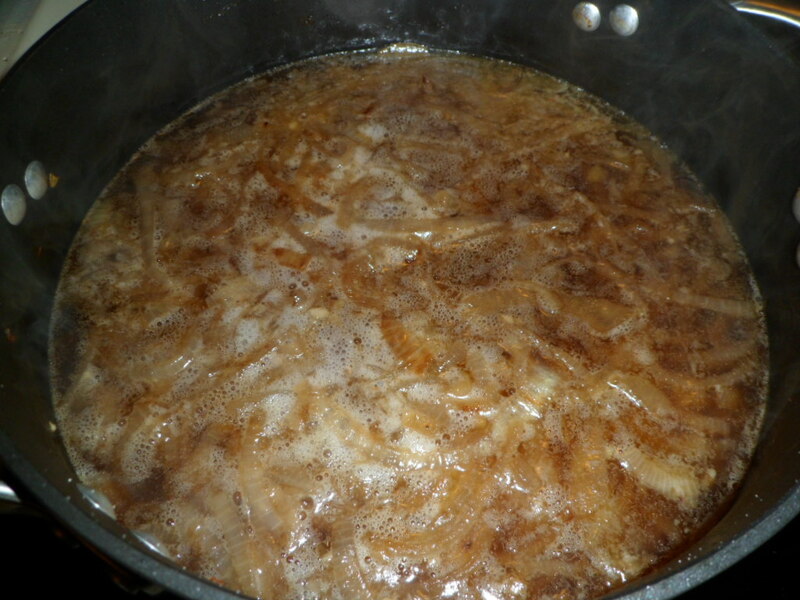 Then enough water to cover the ingredients was added, and the whole thing was brought to a slow simmer. I’m not sure how long I simmered it – several hours, I think. Then it spent the night in the fridge, which made the skimming so much easier. The next day I strained it and poured some into containers and some into ice cube trays to have handy stocklets for flavor. The first thing we made with the stock was beef stew from the How to Cook Everything cookbook. 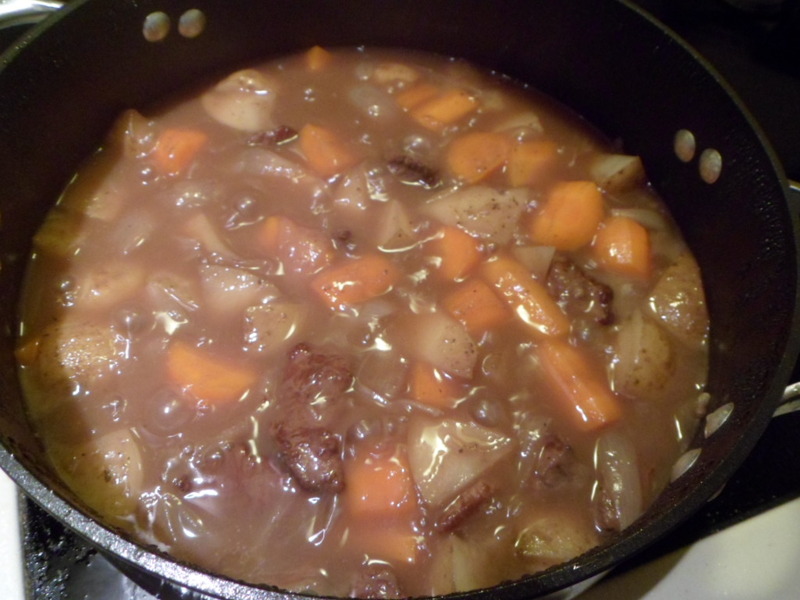 I had some potatoes and carrots from Farmers Fresh that I’d been dreaming of using in stew. By the way, I love onion soup, but I’ve never seen the point of “French” onion soup where you cover the top with cheesy breadness. It just makes it hard to eat. Much better is to make the soup and some killer cheese toast (with good cheese and bread) on the side. Then you can dunk the toast to your heart’s content. The stock’s all gone now except for the stocklets. Guess I’ll have to make more soon so that we can make vegetable soup.